These grab-and-go breakfast options require little to no assembly for when you need to dash out the door first thing in the morning. When possible, I suggest preparing some of these recipes over the weekend to set yourself up for success during the busy week ahead. And remember, always do the best you can under the circumstances rather than aim for perfection. In a soup or cereal bowl, combine the chia seeds, cardamom, and cinnamon. Then, pour the warm water or nut milk over the mixture. Let rest to firm up, about 20 to 30 minutes. In the meantime, wash the fruit and slice into bite-sized pieces, if needed. 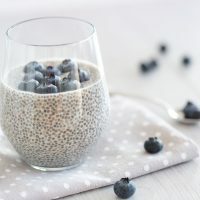 Top the thickened chia seed pudding with the berries, coconut flakes and any seeds. Enjoy! Add all ingredients to a blender and process until frothy. Note: Always be very careful when pureeing hot liquids in a blender. The heat from the liquid can cause the pressure in the blender to build up under the lid, and when the blender is turned on, the top can blow off and your hot liquid will go everywhere. Keep the lid vented by removing the small insert from the middle of the blender lid; hold a folded up towel over the opening to prevent splattering. Always start on the lowest speed possible. Start by hard-boiling the eggs. Fill a medium (3 to 4 quart) pot about half full with water. You will want enough water to cover the eggs once they are placed in the pot. Over medium-high heat, bring the water almost to a boil. Add the vinegar and 2 teaspoons of the salt, and then gently sub-merge the eggs into the water. To make it easy, use a slotted spoon or a long-handled mesh strainer. Turn the heat down to low, and simmer the eggs for 15 minutes. While the eggs are simmering, prepare an ice bath. Fill a medium bowl half full with ice, then fill three-quarters full of cold water. Set it by the stove to chill the eggs when they are done simmering. While the eggs are simmering and cooling, make the dressing. Add the mayonnaise to a medium bowl and stir in the curry powder, lime juice, ginger, remaining salt, pepper, and cayenne and mix until smooth. Then stir in the celery, shallot, and cilantro. Set aside. When the eggs are done cooking, use a slotted spoon to remove them from the pot and immediately place into the ice bath. Cool the eggs until cold. Peel the eggs by cracking them all around on the edge of the sink and rolling them gently in your hands under running water. The shell should come right off. Chop the peeled eggs and add to the bowl with the dressing and mix gently. If the salad seems stiff (it will depend on the thickness of your mayonnaise), add a little water to make it softer and creamier. Start with 1 to 2 teaspoons and add until the salad is as creamy as you like. To serve, place 2 cups of salad greens on each of 4 dinner plates. Scoop 1⁄2 cup of the egg salad onto each plate and serve. Store leftover egg salad in a covered container in the refrigerator for up to 3 days. Place all ingredients in a blender. Blend together until smooth, adding water, as needed, for desired consistency. Preheat the oven to 350°F. Grease a 9- by 5-inch loaf pan with the coconut oil. Cut a piece of parchment paper to fit in the bottom of the pan and lay the parchment in the pan. Place the sweet potato slices in a medium saucepan and cover with about 1 inch filtered water. Bring to a boil over high heat and cook until tender, about 5 minutes. Drain the potatoes in a colander, then return the slices to the saucepan. Using a potato masher, mash the potatoes until smooth and allow to cool to room temperature. In a bowl, combine the coconut flour, cinnamon, nutmeg, mace, baking soda, baking powder, and salt. In a separate large bowl, whisk the eggs until combined. Add the mashed sweet potatoes and the almond butter, melted butter, and almond extract and whisk gently until well combined. Add the coconut flour mixture and mix with a rubber spatula until evenly moistened. Pour the batter into the prepared loaf pan and bake until a toothpick inserted into the center comes out clean, 50 to 60 minutes. Invert the bread out of the pan onto a wire rack and allow to cool completely. Cut the loaf into 1-inch slices and serve. Store tightly wrapped in plastic wrap at room temperature for up to 4 days.